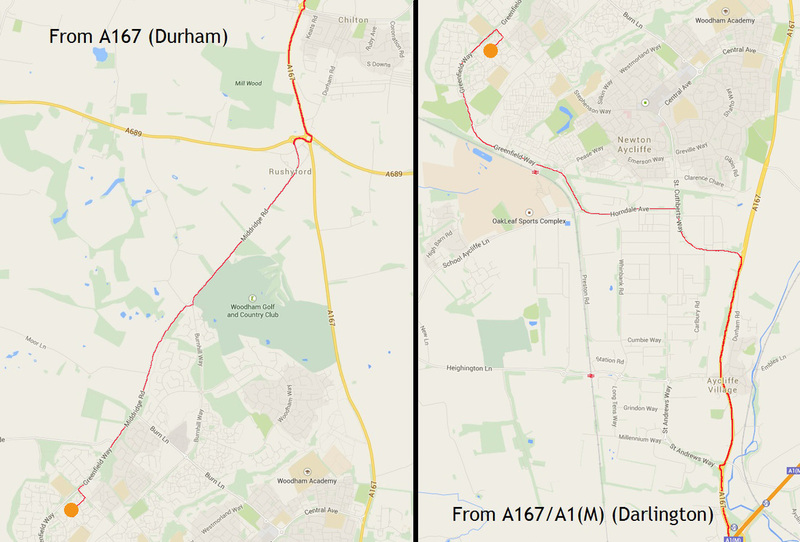 Travel through Aycliffe village and at the start of the dual carriageway section turn left at the traffic lights onto St Cuthbert's Way (B6443)(see photo 1). Then from St Cuthbert's Way, take 2nd Left (before you reach the blue bridge) onto Horndale Avenue. Follow this road for app 1mile (passing over a painted mini-roundabout), then at the next major roundabout take the first exit onto Greenfield Way (passing Newton Aycliffe Railway Station on the left). Proceed along Greenfield way for another 1 mile, passing over another roundabout, then with Byerley Park Primary School on the left, turn right at the painted (off centre) mini-roundabout onto Meadowfield Way. Then take the first right into Stainmore Crescent. The Church should now be visible at the top of the crescent. 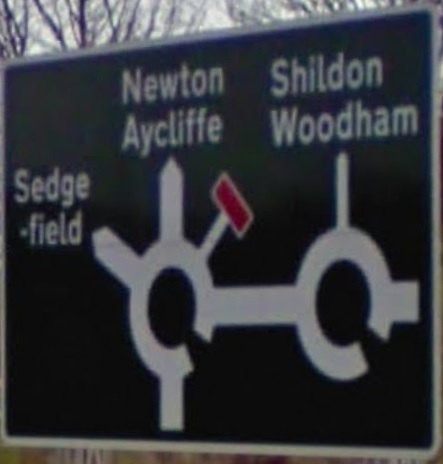 On the approach to Rushyford roundabout take the 4th exit off (see Photo 2) then you immediately come to another roundabout which you need to take the 1st exit (signposted Shildon / Woodham). Travel along this road for about 1 mile then take the 2nd exit at the next roundabout (signposted Shildon / Middridge). Carry on along this road, you enter a 40mph speed limit area and after another 1 mile turn left at the painted (off centre) mini-roundabout onto Meadowfield Way. Then take the first right into Stainmore Crescent. The Church should now be visible at the top of the crescent.